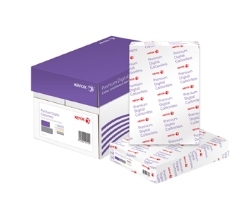 Xerox Premium Digital Carbonless Paper is a range of A3 premium NCR papers specifically designed for the production of high quality, short run business form sets on your mono or colour laser printer, digital press, or copier. Choose from single reams in white or coloured so that you can make up your own multi-part forms (also useful if you plan to use multiple feed or output trays in your printer). (Useful Tip) For 2-part forms you will need a CB and CF sheet. For 3-part forms you will need a CB, a CFB and a CF sheet. For 4+ part forms, simply add additional CFB sheets. Delivers benchmark image legibility on multiple-part forms.